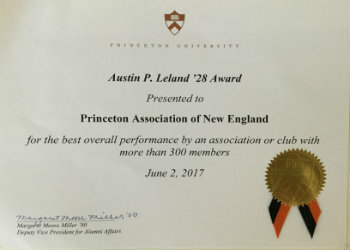 The Princeton Alumni Council selected PANE to receive the Austin P. Leland '28 Award, which recognizes the regional association with the best overall performance for associations and clubs in regions with at least 300 members. PANE Board President Bob Ruxin '76 accepted the award at the annual Alumni Council Luncheon during Reunions on Friday, June 2. There are more than 160 Princeton regional associations around the world, connecting Princetonians within a certain geographic boundary to each other and the University. Associations organize activities ranging from social gatherings to alumni interviewing to programs featuring Princeton faculty. Congratulations to all PANE members, especially Bob Ruxin, Mary Koger and Donna Armentano for outstanding leadership over the last decade!